Last year, I discovered that I really love the taste of zucchini with marinara sauce, so this year I decided to try making my own zucchini spaghetti noodles. If you haven’t tried making your own zucchini spaghetti noodles yet, well, you’re in for a real treat. It is super easy, delicious, gluten-free and low cal. Yes! 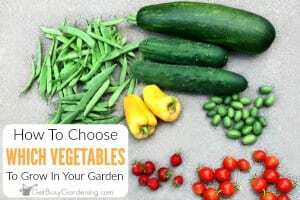 Zucchini is one of those vegetables that provides an over abundance of produce from the garden (a great problem to have!). 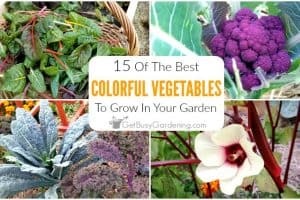 I’m always trying to come up with creative ways to use up my garden fresh zucchini, and it’s a very common subject on my social media pages. 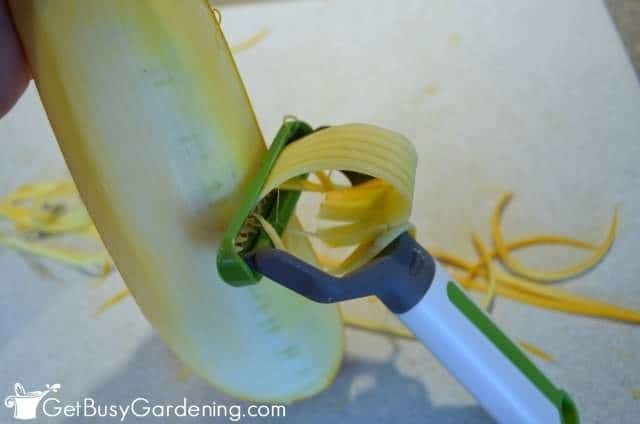 It’s super easy to make zucchini spaghetti noodles, you just need the right tool for the job – and that tool is a julienne peeler. 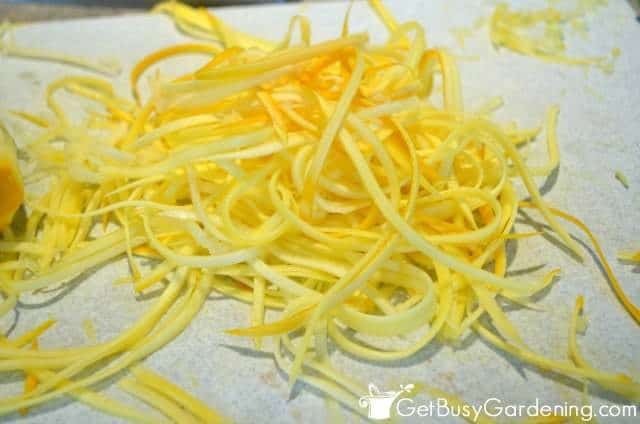 A simple julienne peeler is very inexpensive to buy, and it works great to shred the zucchini into thin strips that are the perfect size for spaghetti noodles. The julienne peeler is really easy to use too. You just use it the same way you would use a potato peeler. It only takes me a few minutes to turn an entire zucchini harvest into a huge bowl of yummy spaghetti noodles. 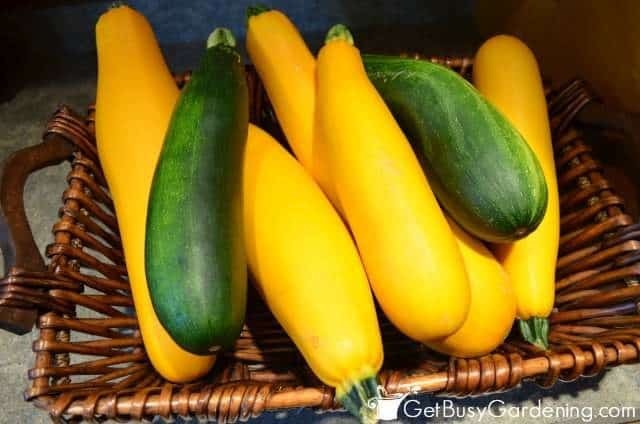 You only want to use the outer edges of the zucchini to make spaghetti noodles, and stop peeling once you reach the core of the zucchini. Trying to shred the core will only result in mush. 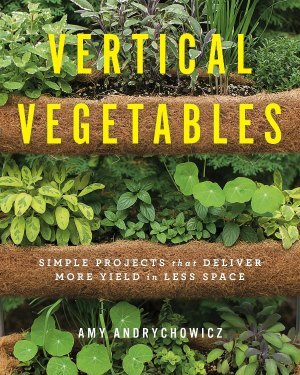 It would be wasteful to just toss the cores of the zucchini into the compost bin (although you certainly can do that if you want). So I toss the cores into my food processor instead, and make zucchini puree out of them. 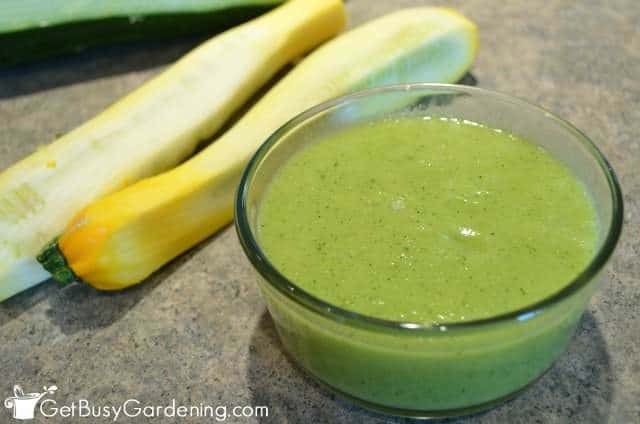 You can add zucchini puree to anything, including soups, sauces or smoothies. Yum! 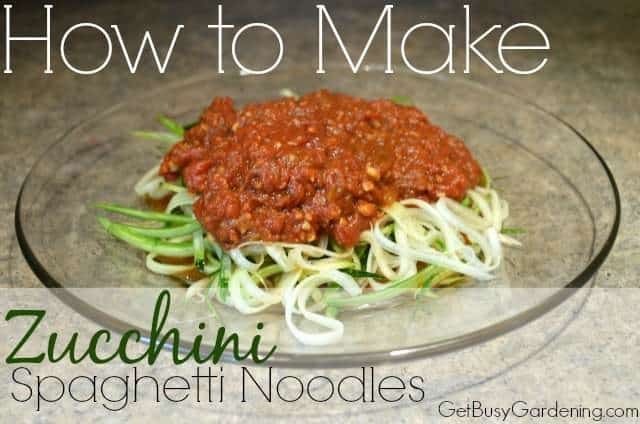 Once you’re done shredding your zucchini into spaghetti noodles, you can use the noodles right away. I prefer to use zucchini spaghetti noodles raw rather than cook them. Tossing them with hot spaghetti sauce warms the noodles up so they are ready to eat. You can also flash cook zucchini spaghetti noodles by dropping them into boiling water, and then removing them right away. Personally, I think the noodles get too mushy when I flash cook them, and I prefer them to be crunchy. 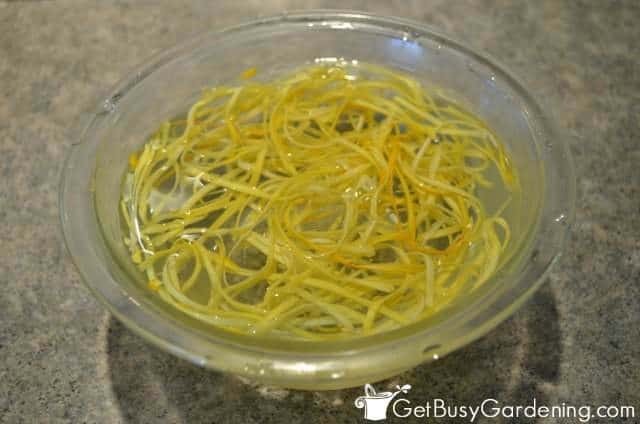 Now that I’m hooked on zucchini spaghetti noodles, I wanted to figure out a way to preserve them so I can enjoy them all winter long. I could freeze them, but freezing zucchini draws out a lot of water, and the noodles will be mushy once thawed (still edible, but too mushy for me). So, I decided to try dehydrating them in my dehydrator – and that worked great. 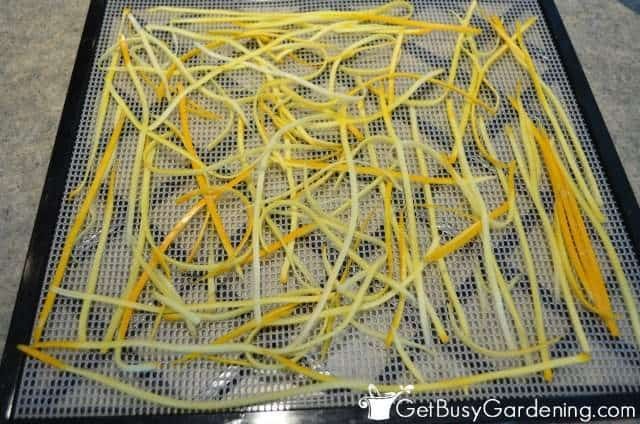 The zucchini spaghetti noodles do stick to the dehydrator trays, and someone told me that using the non stick drying sheets would work better – but I haven’t tried them yet. It takes several hours to dehydrate zucchini spaghetti noodles in my dehydrator, and the result is a super thin and slightly crispy noodle. After dehydrating the noodles, I tested them out in my spaghetti. You can use the dehydrated noodles directly in your spaghetti, or you can rehydrate them first by soaking them in water for 10-15 minutes. To my delight, rehydrating the noodles brought them back to their crunchy, pre-dehydrated deliciousness – which is how I prefer to eat them. 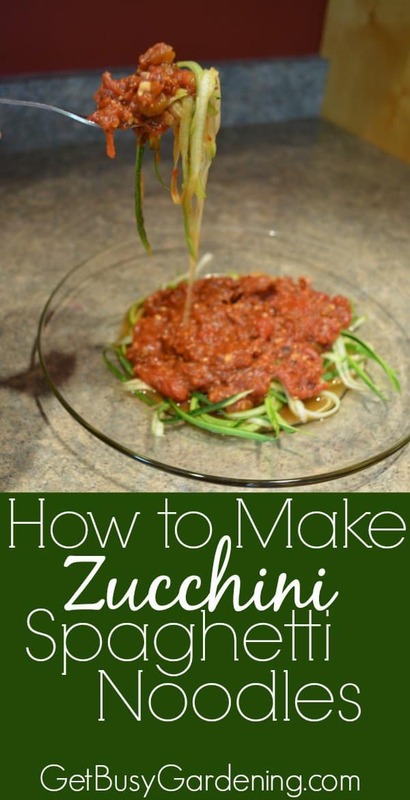 I’m so excited that I experimented with zucchini spaghetti noodles this summer. 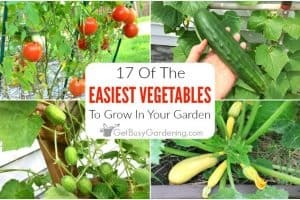 I will be dehydrating them like crazy this fall, and will be enjoying garden fresh zucchini spaghetti noodles all winter long. Woohoo! What are some of your favorite ways to use zucchini from your garden? 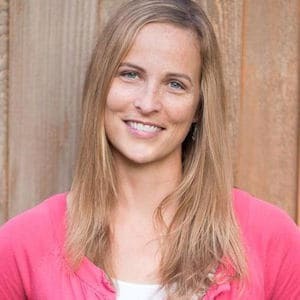 Amy, I learn so much from you! I will so try this! I’ve actually cooked zucchini spaghetti and love it! Even my picky son love them. I enjoy using your creative recipes. Thank you. Excellent idea! I also use my dehydrators ALOT! 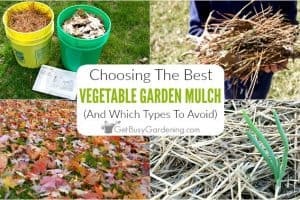 I found that dehydrating leftover grilled veggies then grinding them makes a wonderful addition to just about anything! I’ve come up with many flavor combos. My fav is grilled onion, peppers and zucchini. It’s wonderful in either cream cheese or Greek yogurt as a spread! Wow, great idea! Thanks for sharing. We dehydrated a bunch of our onions last year and made onion powder. So easy! Love making veggie spaghetti, so much healthier and still so good! Thank you for sharing at Merry Monday! This looks amazing! Thanks for sharing with the Delicious Dishes Recipe party this week!